When Carly T., 45, wanted to take her custom textile business to the next level, she wasn’t entirely sure where to start. The divorced mother of one had already taken her firm from her kitchen table to a warehouse workspace in her city. While she was immensely proud of what she’d accomplished, she also knew the next steps were critical to reach a higher level of success. Colleagues and competitors alike seemed to emphasize the importance of being active on social media for her business – to get known and to build trust. Carly did a little research and talked to a lot of current customers. She found that her lack of consistently being visible to her customers seemed to be a problem. They wondered what new projects she was working on and what she thought about some of the recent changes in her industry. It was clear her customers were interested in her take on the industry and trusted her opinion. They just were not hearing from her. They wondered why she was missing from the conversation. She still wasn’t sure how to tackle her problem but she had identified a key component that she was missing: clear, helpful content. You may have done similar research for your own business and probably have heard social media marketers advising to use third party content. But what is third party content, anyway, and why is it being recommended left, right and center? Perhaps most importantly, should you use it instead of generating your own original content? 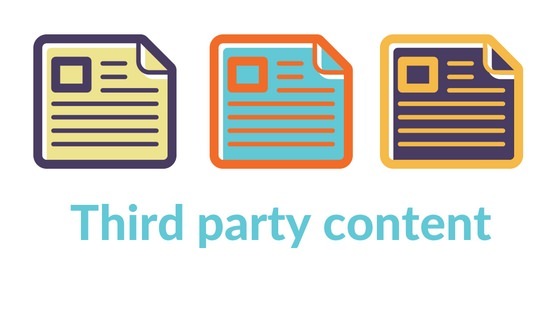 “Third party content” is exactly what it sounds like — content that was created by someone else. You don’t own that fascinating article that you just shared on Twitter, and so you will need to give the third party creator the credit he or she deserves. Use Third Party Content Rather Than My Own? Don’t thing “rather than” think “as well as”. Sharing original content is very important. Your customers need to understand your products, services, point of view or process. However, you and your company are part of an industry. And in the industry you serve, it is important to understand what is going on. Understanding what is happening in your industry and being able to explain it to others is very helpful. As is being able to have an opinion of how the changes will affect your customers. Sharing this kind of information can help set you apart from the competition. Sharing industry information on social (with a couple of sentences written by you introducing the article) can be very helpful for your clients and customers to keep up with the industry. Do understand, they are just as busy as we are. A trusted source to curate and make sense of all the information available daily can be a life saver. You may finally be convinced that directing your followers to third party content will benefit your company and help to build trust. But where can you find quality information? Where Can I Find Great Third Party Content? Start with the known industry publications. These could be the journals, newsletters, blogs, podcasts, videos, reports that many people in your industry are aware of and think highly of. Chances are they don’t have the time to consume it all. Share the third party content, but when you do, be sure to credit both the publication and the author. In some industries, it can feel like everyone is sharing the same articles. Here’s where you’ll need to dig a little deeper. Are there blogs and publications covering your industry that are from other countries? Perhaps their articles can give a different spin on the top issues. Note any questions or concerns that your customers or followers have raised. It’s a win-win if you can find targeted third party content that addresses those issues. It makes you look responsive, current and reinforces your position as expert as you continue to build trust. You must also be able to make a connection between what your brand stands for and the content you’re sharing. We’re judged by what we share, so ensure you’re sharing information you’d be pleased to be associated with. “Wait,” you say. “That sounds pretty challenging.” That’s because it is. While sharing third party content saves you from having to create your own, it is time consuming to find interesting articles that also benefits your audience and relates directly to your brand. And don’t forget that, as an expert in your field, before posting content you must ensure that it’s accurate and timely. It’s your brand that suffers if it’s not. You’re judged by the content you share. While your readers don’t really care if you wrote the content or not, they do care whether it’s interesting and helpful to them. They’ll keep following (and buying) if they find what you post to be helpful. You can outsource this task to a reliable marketing company who already has a vetted and effective process to find third party content for clients. You’ll have a briefing with the company, they’ll then find the first batch of content, provide it for your review and feedback. It may take a couple of rounds to get everything working smoothly. 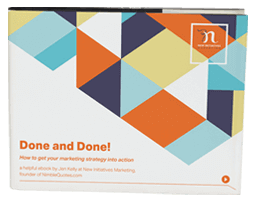 You’ll then have the choice to take that content to schedule and post yourself, or leave that task to your new marketing partner. Many clients go this route, leaving them time to interact with and respond to their audience on social media. The good stuff! The relationship building stuff! The social stuff! This is the route that Carly T. decided on. She found a marketing company that offers a service to consistently find and post quality third party content to her social profiles. Sharing third-party content has helped her to be seen as a well-informed business leader in her industry. She is also starting to develop a reputation as the go-to person when questions and requests for custom textile work come up. Third-party content, as part of her social media strategy, has allowed her to build trust with ideal clients. Adding third-party content to your social media profiles may seem overwhelming at first, but its benefits far outweigh the difficulties. We’re good at this. Contact us to find out more about adding industry-specific third party content to your social profiles. We’ll talk you through what’s involved and answer any questions you have. Call or email today.